Gasthaus/Gosebrauerei Bayerischer Bahnhof | Beer Apprentice - Craft Beer News, Reviews, Interviews and Info. Hello everyone. How y’all doing? Well, I hope. For today’s craft beer review I’m going to be trying the Bayerischer Bahnhof Berliner Weisse produced by Gasthaus & Gosebrauerie Bayerischer Bahnohof out of Lipzig, Germany. I’ve yet to have a brew from these guys, so let’s see what kind of information we can find out about this beer. I couldn’t find a specific brewery website, so let’s jump over to ratebeer.com for some info. Huguenots may have originated the style as they traveled through France to Flanders, having first mentioned it in the 1600s. During their time, there were said to be seven hundred weissbier breweries in Berlin. Later, in 1809, Napoleon and his troops identified Berliner Weisse as the Champagne of the North. He requested the beer be served w/syrup to cut its extreme level of acidity. Bayrischer Bahnhof’s interpretation is a slightly softer, more mellow version of the “Berliner Weisse” style with a beautiful balance of tartness, fruitness, and sweetness. This brew comes in an 11.2 oz. bottle and it has an ABV of 3.0%. It poured a hazy, straw, yellow color with a bright white head. It was kind of soapy, but soft and feathery. The size was moderate, the retention time mostly average and the lacing left a little to be desired. Oh well, that’s not the most important aspect of the beer anyway. The nose relinquished tones of lightly tart lemon citrus. A slight bit of funk too. A decent shot of wheat comes through as it warms to add a solid backbone. Overall, the bouquet seemed to be balanced fairly well, albeit a touch subdued. The flavor announced some grassy tones that I didn’t pick up on in the aroma. Other than that it followed suit with the fragrance. Lightly soured lemon with a bit of tartness and welcomed funk. The wheat, again, gave the profile some footing and created a pleasant savor. Not overly robust, but rather easy going and simple. The mouthfeel was medium to thin. Soft and a touch watery. Smooth, crisp, refreshing and thirst quenching. The carbonation was good, however what flavor was tasted vanished a little quicker from the palate than I had hoped. This was, no doubt, a decent beer. The drinkability was superb. Absolutely perfect for the warmer weather and would fit well after doing some yard work. It’s not overly robust or “loud”, yet it still has enough flavor and character to keep one satisfied throughout the duration. I’d recommend giving it a try for sure. I doubt that you will be blown away by it, but I don’t think you will be disappointed either. 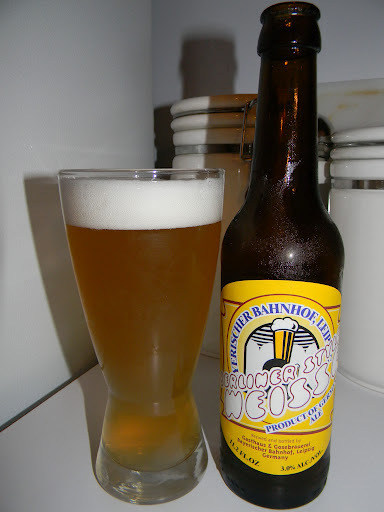 So, if you happen to see the Bayerischer Bahnhof Berliner Weisse in your bottle shop, pick it up and give it a try.